Imagine skin free of noticeable wrinkles and folds. Imagine enhanced facial contours and full, sensuous lips. Imagine a fresh appearance. Imagine no further, with injectable dermal fillers at Dermedix Clinic. Dermal fillers are a non-surgical treatment to rejuvenate the face by reducing fine lines and wrinkles. As we get older, we start to lose volume around certain areas of the face which can make us look tired and sunken. This is caused by the body’s decreased ability to produce collagen and elastin. Unlike wrinkles which require muscle relaxants to soften them, facial volume and folds require a dermal filler to help re-volumise and hydrate the area. Dermal fillers are highly effective at restoring the fullness and plumpness of the area they are applied to, as well as stimulating the growth of collagen giving your skin a much needed hydration boost. As we age, facial fat pockets degenerate and the skin loses its suppleness. This can leave the face sunken and gaunt, with lax skin drooping past the jawline. Age-related volume loss can cause the face to lose definition, balance, and shape, all of which can make a person appear older than their years. There are two (2) primary types of dermal fillers available: permanent and temporary. These are made from substances that are not absorbed by the body, which is why they last longer. However, results from permanent fillers often look artificial. These usually contain hyaluronic acid, a substance that occurs naturally in the human body. The hyaluronic acid breaks down over time, and is absorbed by the body. This eventual breakdown is what makes them temporary. The first step is to schedule a free consultation with our professional specialist who will discuss your health and medical history with you, ask about your goals, assess the areas you want to have treated, and will answer any questions you have. A numbing gel will be applied to the areas to be treated, to help minimize discomfort. Once this has taken effect, the treatment will begin. 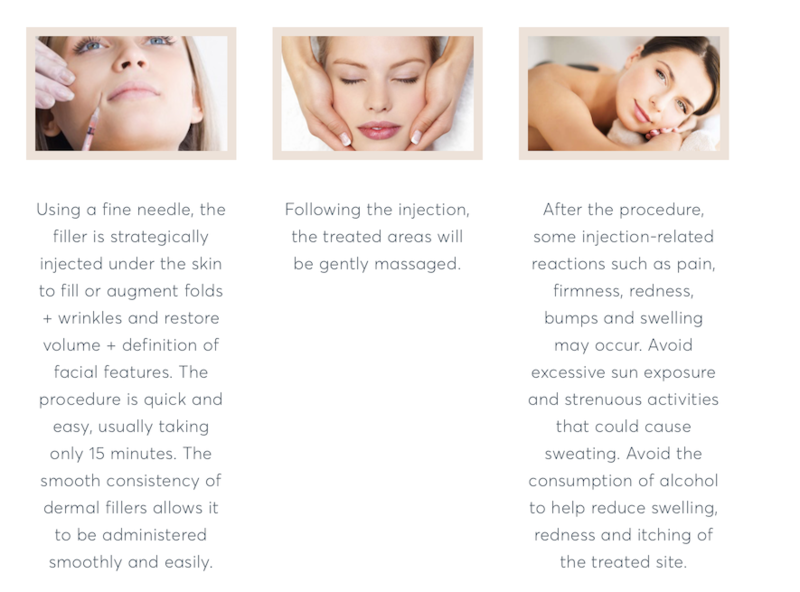 The filler is injected through a fine needle into the outer layer of your skin. At regular intervals, your treatment specialist will massage the treatment area until the desired effect is achieved. Your dermal filler treatment should take less than 30 minutes. The newly injected hyaluronic acid will begin to bind water molecules to increase volume below the skin. You may have a tiny bit of bleeding, and you’ll see some redness in the area, which will go away within the hour. You’ll also see some swelling, but majority of it will be gone within three days. You’ll be able to return to your daily routine right away, and our treatment specialist will call you within a week to make sure you’re not experiencing any negative effects. Dermal Fillers are a non-surgical treatment that will add volume or plump up areas where wrinkles and folds have appeared due to ageing. Dermal fillers will help to smooth lines, enhance lips and restore cheeks to give you a more youthful and fresh faced look. Dermal Fillers are suitable for any part of the face, including lines and folds around the forehead, nose and mouth. This non-surgical treatment can be performed to enhance shallow contours and improve deep acne scars. Dermal fillers are intended for adult men and women of any age. If you want to preserve your youthful appearance, or you wish to improve the look of existing fine lines and wrinkles, dermal fillers may be the solution for you. Younger patients who are under 30 years of age are a growing clientele. Regular treatments not only reduce the fine lines they already have but also help to prevent additional ones from forming in the future. Regular treatments can slow the natural wrinkling of the skin that comes with age. Dermal fillers are a good option for you if you want to soften the appearance of facial wrinkles, restore your facial contours and/or plump your lips. Do not use Dermal fillers if you are pregnant, breast feeding or bruise easily. If you are unsure of your suitability our doctors will advise you further at the consultation. How long will the results last for temporary Dermal Fillers? Duration depends on many factors, such as the individual’s skin type, lifestyle and age. After the initial treatment, follow-up sessions are normally recommended around every 6 to 12 months depending on the individual and the treatment. A treatment of the lips lasts about 6 months. Your doctor will give you more information during your consultation. Your treatment specialist will advise you fully of post-treatment care at your consultation. After the treatment, some common injection-related reactions might occur, such as swelling, redness, pain, itching, discoloration and tenderness at the injection site. These typically resolve spontaneously within 2 to 10 days. The use of anti-inflammatory drugs or aspirin will almost always cause bleeding or increased bruising at the injection site. No exercise except for walking for 24 hours after the procedure. What are possible side effects when using Dermal Fillers? Most dermal filler side effects are mild and short, which include but not limited to redness, tenderness, swelling, firmness, bumps/lumps, itching, bruising and discoloration. Like all skin injections, there’s a risk of infection. Is there downtime post-Dermal Filler treatment? There is minimal to no downtime after using dermal fillers. Most patients can return to work or any other normal activities immediately, with only slight redness or soreness in the treated area.